You can build a guitar. Yes, you! Above: Shane Speal rips the blues through a simple 3-string cigar box guitar. Step back in time and make the coolest old time instrument ever! Cigar box guitars date back to the mid 1800's when folks had plenty of creativity, but not a lot of money. Blues and country legends started on them and now a modern resurgence has turned the cigar box guitar into one of the biggest things in music today. Bet you can't build just one! 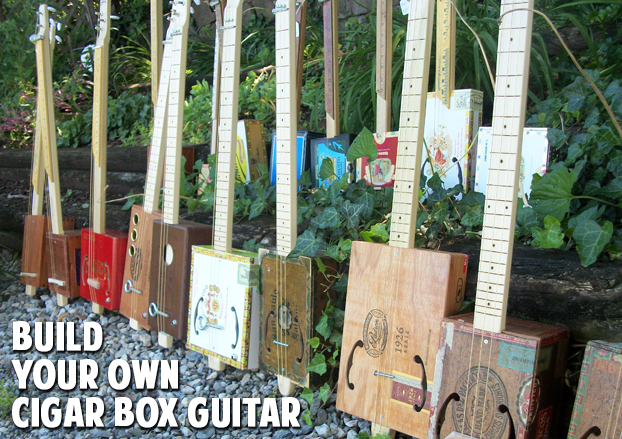 You can make your own cigar box guitar! The instrument follows the Depression Era "stick through box" design and uses a simple 1x2x34" piece of poplar (found at Lowes, Home Depot and other big box hardware stores - or your scrap wood bin). Real guitar tuners and strings deliver the great sounds as heard above. Once you get the plans, you'll need parts. 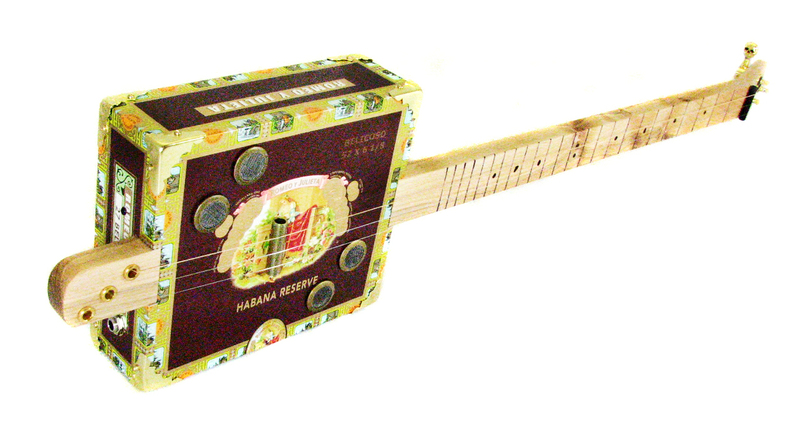 Check out the Cigar Box Guitar Parts Kit (below). It contains all the hardware, strings and even the cigar box. Simply add your own 1 x 2 x 34” hardwood plank for the neck. BUY NOW: 3-String Cigar Box Guitar Kit with How-To Guide - Great for Woodworkers! What tools do I need for the basic kit? You will only need a saw, screwdriver and a drill. You won’t need a dedicated woodshop or expensive tools. Each kit includes a 26-page, easy to follow guide chock full of detailed photos and instructions. See the whole process in these step-by-step videos by Chris McDowell! We designed this kit for the beginning woodworker. If you’re looking for an even simpler kit, check out our Pure & Simple Cigar Box Guitar that you can assemble with only a screwdriver! Are there lessons to play this once I’m done building it? Yes... and they’re totally free! C. B. Gitty is dedicated to the education and preservation of the cigar box guitar. Go to CigarBoxGuitar.com, our knowledgebase of free lessons & information.